Rare Earth Metals Market size was over USD 9 billion in 2016 and will grow at a CAGR over 9% over the projected period. The rare earth metals market encompasses 17 elements that are majorly found together in Earth’s crust, and exhibit similar properties. Extraction and processing of these elements from their ore forms to separate minerals is a complicated process and requires significant investments. Cerium, lanthanum, and neodymium are the more commonly occurring rare earth elements. Samarium and praseodymium are light rare earth metals and readily found as compared to the heavy rare earth metals such as gadolinium, europium, terbium, holmium, dysprosium, thulium, erbium, lutetium, and ytterbium that are less abundant. Due to variations in physical, chemical, molecular and application characteristics, different rare earth metals possess their own market drivers and challenges. Over past years, the major driver for rare earth metals market is increasing consumption in permanent Neodymium-Iron-Boron (NdFeB) rare earth magnets, in which rare earth metals such as praseodymium, neodymium, terbium, and dysprosium are used. Moreover, out of all these rare earth metals, neodymium is the main component. The added existence of praseodymium in magnets contributes to improved resistance against corrosion along with reduction of the magnet’s performance, whereas dysprosium, and terbium improve the magnet’s performance at very high temperatures. Cerium, Lanthanum, and some other elements are widely used in applications such as metallurgy, catalysts, glass, ceramics, optical instruments, and polishing.The rare earth metals market encompasses 17 elements that are majorly found together in Earth’s crust, and exhibit similar properties. Extraction and processing of these elements from their ore forms to separate minerals is a complicated process and requires significant investments. Cerium, lanthanum, and neodymium are the more commonly occurring rare earth elements. Samarium and praseodymium are light rare earth metals and readily found as compared to the heavy rare earth metals such as gadolinium, europium, terbium, holmium, dysprosium, thulium, erbium, lutetium, and ytterbium that are less abundant. Magnets made up of NdFeB offers various applications in electric motors in wind turbine generators, electric vehicles, hybrid vehicles etc. In addition to this, these magnets possess high energy to weight ratio which helps in reduction of the size of portable electronics, computers and other smart devices like medical imaging equipment, such as MRIs, X-ray etc. Growing demand for renewable and clean energy has increased the demand for rare earth magnets in energy generation processes, as they give improved performance compared to other magnets. A typical 3MW wind turbine requires approximately 600 KG’s of rare earths for manufacturing motors, and generators. According to a presentation by Lynas Corp., the consumption of rare earth metals in electric and hybrid vehicles will reach 12 kilo tons by 2024. Rising focus on utilizing clean energy is pushing the demand for electric vehicles, which in turn will drive the demand for rare earth magnets in electric motor and generator applications. Moreover, increasing applications of cerium and lanthanum in battery, and catalytic convertor applications, will drive the global demand of rare earth metals from 2017 to 2024. According to Lynas Corp., the rare earth metals’ demand in wind turbines will reach 4 kilo tons by 2024. In addition, based on the forecasts by BNEF, onshore wind power will account for a quarter share of all new global power generating capacity additions over the coming 20 to 25 years. This indicates the growing demand for wind turbines, and this will in turn propel the consumption of rare earth metals in their applications, and contribute to the growth of global rare earth metals market over the coming years. Irregularities in both demand and supply of rare earth metals acts as a major restraint for the growth of global rare earth metals market. Globally, the supply of rare earth metals is majorly concentrated in very few countries, while demand is spread across the entire world. As a result, trade plays a major role in reaching rare earth oxides to all the end-user industries across the world. 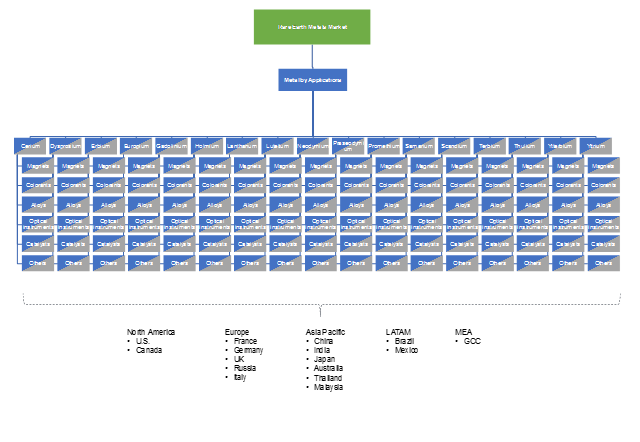 The current rare earths production is mainly restricted to some countries like U.S., and China. Due to this, high dependency on a few mining sites is being caused, and any minute disruption in production, results in huge fluctuations in metal prices, and challenges their availability. Lanthanum, and cerium are projected to have higher demand than other rare earth metals, as they have vast applications in battery, and catalytic applications. In addition, the inexpensive nature of these two metals will also help their applications to grow in the coming years. In terms of market revenue, scandium, and neodymium are predicted to witness higher market revenues, as their prices are very high compared to other metals. Moreover, these metals find applications in metallurgy, glass, ceramics, polishing, and optical instruments will further augment their growth in the forecast timeframe. Magnets application segment is projected to have the major market volume, followed by catalysts, and alloys. Increasing consumption of rare earth magnets in electric motors, turbine generators, electric vehicles, and other automobiles will propel the demand for rare earth magnets, and contribute significantly to the growth of rare earth metals market. In addition to this, rising demand for renewable energy equipment, and electric and hybrid automobiles will in turn accelerate the market growth over the projected timeframe. Asia Pacific is the major producer, consumer, and the fastest growing in the rare earth metals market. The Asia Pacific rare earth metals market revenue will grow at a CAGR of over 10% by the end of the projected period. China is the major consumer of rare earths in the entire Asia Pacific region. The demand for rare earth metals in China will grow over a CAGR of 9% till the end of the forecast period. High domestic demand will majorly account for the growth of China rare earth metals market over the forecast period. Moreover, stringent government regulations to control illegal mining activities will further augment the regional market growth over the coming years. 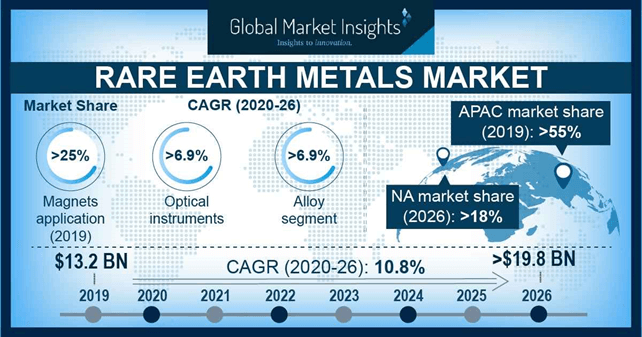 Moreover, growth in consumer electronics, automobiles, and energy equipment markets will further push the Asia Pacific rare earth metals market over the projected period. Key players in this market such as Iluka Resources, China Minmetals Rare Earth Co. Ltd., Neo Performance Materials, Alkane Resources Ltd, Arafura Resources Ltd., Great Western Minerals Group Ltd., Lynas Corp., Canada Rare Earth Corporation, India Rare Earth Ltd., and Avalon Rare Metals have also been profiled in this extensive report. The global rare earth metals market has witnessed some significant price fluctuations in 2017. China remained as the major power in this market, and will account for a significant market share by the end of 2017. In addition to this, China is the major producer and exporter across the globe. However, few companies in this market have started their mining facilities outside China to balance the trade activities. For instance, Lynas Corp., have started their new production facilities of rare earth metals in Australia.